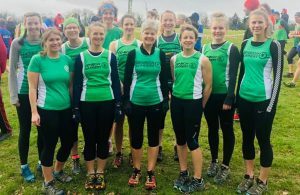 This week it was all about Cross-Country – the fourth and penultimate race in the North Wales league series and with the Men’s and Women’s teams in Division 1 for the first season – the fight is on to stay up. Both teams are still in a fragile position and both have our neighbours Prestatyn Running Club as our nearest target – it’s not personal, just the way the season is shaping up. The men closed the gap by 128 points but are still in the relegation zone and need to beat Prestatyn by 139 points in the last match next month at Oswestry to finish 6th. The women are more comfortably in 5th, 127 points ahead of Prestatyn, 78 points behind Buckley, but with Prestatyn scoring 88 in this race versus Denbigh’s 157, nothing is certain. Both races were indecently fast and it was great to see Shaun Hughes have a go at staying with the front group and then defending his 12th place to the end despite being isolated and a chasing group of four working hard together to catch him in this 4 lap race with 450ft+ climb. Huw Williams has improved a lot to finish as 6th counter with Owen Conry, seventh Harrier home, closing fast. With Vic Belshaw, our fifth counter and 2nd VM55, unable to race at Oswestry we’ll need to go even faster. Hopefully on the tougher, longer course marathon men Dan Jones, second counter and Joe Welch, fourth, can get further up the field while Glen Price, third, holds on as well again. David Baugh, eighth Harrier home, ran a well-judged race and will be better placed to cope with the Oswestry hills than most. Phil Hayes, ninth, Mat Jones, tenth and Steve Gadd eleventh ran well, they may find the Oswestry Hills a shock but they certainly have the speed to have great races. Tony Benton, thirteenth, still has some speed in the aged system and picked off half a dozen rivals on the last lap but missed out on catching his greatest rival, Duncan Jones, twelfth, who steadily widened the gap on the gradients. In the women’s race of 2.5 laps and 300ft+ of climb, we have a number of special mentions. Rhian Pierce ran a carefully judged solo run up front to finish 14th, 2nd VF35 and Denbigh’s first counter, with our next 5 (4 to count), finishing in the top third of the field, led in by a very determined Mel Morris from the fast-improving and exceptionally well-running Elen Baugh. An astonishing final lap by Tracey Williams gave her the honour of being 4th counter just ahead of Katy Baugh and Sioned Griffiths. In her second cross-country Mari Williams looked comfortable ahead of Sali Powell in a reverse of the North Wales Championships at Rhug last week. Menai Baugh cemented her VF60 category win just behind them and Sarah Bayliss zoomed through back after a 5 year break from cross-country. Dawn Marshall, saw the Harriers home, demonstrating that there is no substitute for getting stuck in at every opportunity. A quiet parkrun this week saw Sian Pritchard set a new PB at Bushy as she trains for the London Marathon whilst Jon Whitehead was just off his PB in 26:33 at Bodelwyddan Castle. Dawn Marshall in her first run of the day, paced her sister around Stretford parkrun in 35:59. This entry was posted in 5 Mile, 5K, Cross-country, Parkrun, Road running, Weekly report. Bookmark the permalink.